Regular Day: 7:45 a.m.- 2:55 p.m.
Late Start/Two Hour Delay Schedule: 9:45 a.m.- 2:55 p.m.
Half Day Schedule: 7:45 a.m.- 11:05 a.m. Regular Day: 7:50 a.m.- 3:15 p.m.
Late Start/Two Hour Delay Schedule: 9:50 a.m.- 3:15 p.m.
Half Day Schedule: 7:50 a.m.- 11:15 a.m.
Central Office will send out a phone message to parents and students registered with current phone and/or email information. Local television and radio stations will be contacted. Parents and staff will be notified of the delay via a School Messenger broadcast. Notification will also be given to the television stations listed below. BUSES WILL BEGIN THEIR ROUTES TWO HOURS LATE. SAES (K-6) 7:50 A.M. – 3:15 P.M. 9:50 A.M. – 3:15 P.M.
RBJSHS (7-12) 7:45 A.M. – 2:55 P.M. 9:45 A.M. – 2:55 P.M.
Walkers should not arrive at school more than five (5) minutes before classes start. SPECIAL NOTE: If the reasons for the delay do not improve, school may be canceled. If that occurs, a second alert will be sent via School Messenger. Parents should also monitor local television stations carefully for any change in the delay status. The local television stations contacted are: WNDU, WSBT and WSJV. Keeping parents informed and involved helps to assure student safety and improve student success. With today’s on-the-go lifestyles, it has become more difficult for schools to reach families quickly and effectively. This is why our school has decided to implement a system called SchoolMessenger. SchoolMessenger is an essential tool for notification and communication. The system can be used to notify you of a SCHOOL CLOSING due to inclement weather. It’s an equally effective way to keep you informed of everyday activities, such as event times and locations as well as schedule changes. 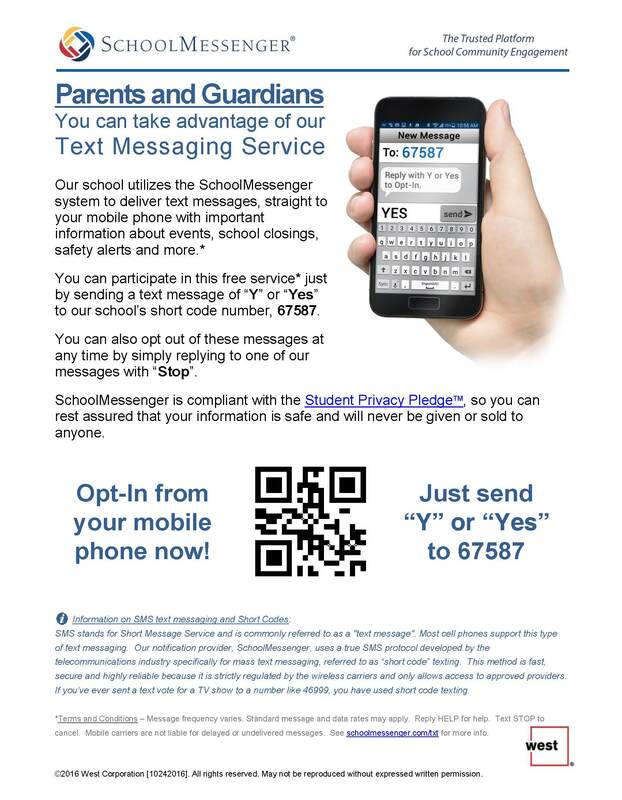 When a need arises, school officials can use SchoolMessenger to deliver a single, clear message to the students’parents or guardians by telephone, cell phone, e-mail, pager, or PDA in any combination.